When I was growing up I sometimes heard certain folks described as "eternal students." The epithet was never meant as a compliment. I was never sure why. After all, what's wrong with curiosity or a desire to learn? These days the catch phrase, at least in some educational circles, is "lifelong learning." I like that one better. At the risk of sounding Rumsfeldian, I would argue that we don't always know what we don't know. But when we figure that out--at 25, or 35, or 85--we are sometimes still eager to fill in the gaps. We decide to do something about what we don't know. We decide to study, and there's nothing wrong with that. As autumn approaches, we begin, once again, to study and learn in a more structured way here at Saint Mary's. It's part of the fall season that I always enjoy. On October 10, at 6:30 PM, the Wednesday Night Bible Study Class will gather once again to begin a close reading of a single biblical text. This year, we will be reading the Letter of James. I think the letter is a good choice for the class, which is more seminar than lecture: the author of the letter asks us to join action to faith, works to grace, as he sketches his portrait of an authentic, moral Christian life. Drawing on the rhetorical techniques of the "diatribe," James does not hesitate to praise virtue and condemn vice. I will be leading the class, and I think that the reading of this letter will inspire many excellent discussions. During October, on four successive Sunday mornings at 10:00 AM, Brother Damien, SSF, and Brother Thomas, SSF, will lead the Adult Forum. I hope that these sessions will give the brothers an opportunity to meet members of the parish and for parishioners to meet and converse with them. Topics for such conversations may include the brothers' vocation and ministry, their vision for a religious community in a Midtown parish, and their understanding and experience of Franciscan theology and spirituality. Both Damien and Thomas are knowledgeable, down to earth, and possessed of good senses of humor. I feel sure that Saint Marians will enjoy meeting and speaking with them. I believe that they can teach us many things. On November 4, Father Peter Powell returns to the Adult Forum to begin his series on a portion of 1 & 2 Kings. He writes, "The Elijah/Elisha cycle [in those biblical books] gives us interesting stories as literature. But of course we don't read the Bible for literature. We read it to discover how God works in our world. Elijah and Elisha prophesied to Israel when it was ruled by Israelite kings. Their relationship to the kings of Israel has much to teach us about how the religious community relates to power. The kings despised Elijah and Elisha for the way they spoke truth to power. They saw the demands of God to be in conflict with the accumulation of power. Perhaps there is a message for the twenty-first century here?" Father Powell's stimulating classes are always popular. He encourages his students to ask hard questions, and we're happy he's agreed to return once again this year. His series takes place on all the Sundays in November and again on the Sundays in Lent. As Advent begins, our resident iconographer, parishioner Zachary Roesemann, will help us prepare for Christmas as he talks about a recent project of his. On Sunday, December 2 and 9, he'll be discussing the Incarnation in light of the theology of the icon, giving examples from his recent work. Zach is also a popular teacher here at the parish. He very helpfully uses vivid illustrations to help us understand theological concepts that can sometimes seem a bit abstract. His classes are always fun and informative, as he teaches us about an ancient and powerful form of spirituality. After the Christmas break, and beginning on Sunday, January 13, John Basil will be leading the Adult Forum in a discussion of Hamlet, that great and iconic play. John is a theater director and a popular, and very effective, teacher. His special expertise is in the plays of William Shakespeare. He has taught hundreds of young actors how to work with the beautiful, but sometimes daunting, language of that great playwright. John is also a great friend of Saint Mary's. For over twenty years he was the artistic director of our parish's former resident theater, the American Globe. YOUR PRAYERS ARE ASKED FOR Al, Flor, Marge, Irma, Chandra, Milena, Perry, Greg, Alexandra, Carlyle, James, Karen, Timothy, Eloise, Carlos, Susan, Marilouise, Ridhima, Lakshmi, Dennis, Robert, Abraham, Randy, Burton, Michael, Greta, May, Heidi, Takeem, David, and Sandy; for Horace, Gaylord, Louis, and Edgar, priests; and for all the benefactors and friends of this parish. GRANT THEM PEACE . . . September 16: 1907 Mary Mildred Grant; 1917 Mary Lavinia Wheeler; 1935 Sarah Emma McFall. THIS WEEK AT SAINT MARY'S . . . Friday, September 14, Holy Cross Day, Morning Prayer 8:30 AM, Noonday Prayer 12:00 PM, Mass 12:10 PM, Sung Mass 6:00 PM. The Sung Mass, which includes a short sermon, takes no more than an hour: "in by 6:00, out by 7:00" . . . Sunday, September 16, The Seventeenth Sunday after Pentecost, Morning Prayer 8:30 AM, Mass 9:00 AM, Mass 10:00 AM, Solemn Mass 11:00 AM, Evening Prayer 5:00 PM. An opportunity for fellowship follows each of the Masses . . . Wednesday, September 19, Sung Mass 12:10 PM . . . Thursday, September 20, Mass and Healing Service 12:10 PM . . . Friday, September 21, Saint Matthew, Apostle & Evangelist, Mass 12:10 PM, Holy Baptism and Mass 6:00 PM. SAINT MARY'S MISSION HOUSE . . . Brother Damien Joseph, SSF, arrived on Monday, September 10, and is getting acquainted with the parish, the building complex, the neighborhood, our visitors, and our guests who seek rest and shelter in the church during the day. He is patiently dealing with the renovations to the fifth-floor apartment, which are going well and are proceeding on schedule. He and Father Smith are meeting by phone with Sister Monica Clare this week to discuss the work of the homeless ministry. Brother Damien will be with us on Sunday morning, and members of the parish will have an opportunity to welcome him then. Brother Thomas, SSF, and Brother Finnian Michael, SSF, still plan to arrive on Wednesday, September 19. Brother Thomas will be joining Brother Damien in residence here in the Mission House. Brother Finnian will be staying for a few days before going on to the friary in San Francisco. Thursday, October 4, is the feast of Saint Francis of Assisi. There will be two Masses celebrated here at Saint Mary's on that day, a Said Mass at 12:10 PM and a Solemn Mass at 6:00 PM. On the eve of the feast, Wednesday, October 3, at 6:30 PM in the Lady Chapel, Brother Damien and Brother Thomas will lead a "transitus" prayer service that marks "the passage from life through death to life" of their patron, Saint Francis of Assisi. All are welcome to attend. AROUND THE PARISH . . . We still hope to receive donations for altar flowers on the following dates: October 14 and November 11, 18, and 25. If you would like to make a donation, please contact the parish office . . . Pledge to keep up with your pledge! During the summer months we sometimes experience cash-flow problems as many friends and members of the parish are away, taking much-needed vacations. 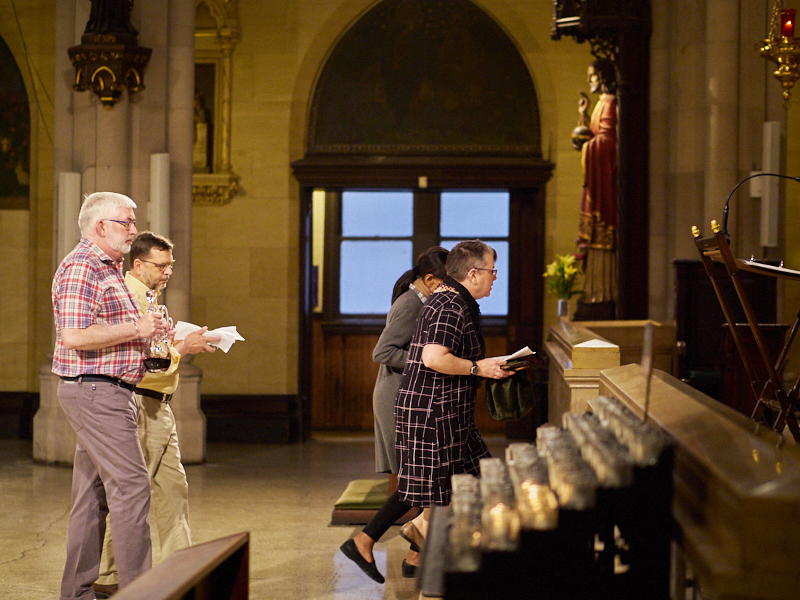 We are grateful to all those who continue to support the mission and witness of this parish . . . Attendance: Last Sunday 143. ANGLICAN SISTERS & BROTHERS . . . We continue to hear about the needs and concerns of Anglicans around the world. The diocese of New York still welcomes donations to assist our brothers and sisters in the Caribbean affected by last autumn's hurricanes. The bishops of our diocese recently asked for help for the Church of South India following severe flooding in Kerala. We continue to read news about the serious divisions in the diocese of Haiti in the aftermath of the recent episcopal election there. Please keep the church in Haiti in your prayers; and please pray for all those who are living with the effects of war, violence, fire, famine, disease, poverty, and disaster. FROM THE MUSIC DIRECTOR . . . Henry Purcell (1659-1695) is the composer of Sunday's musical offering during the ministration of communion sung by soprano Elaine Lachica. Purcell, more than any other composer of his time, defined English Baroque musical style in a variety of vocal and instrumental genres that included works for theater, court, and church. He was born in London and his family home was virtually in the shadow of Westminster Abbey where he became organist in 1679. Standing on the foundation laid by such composers as Tallis (c. 1505-1585), Byrd (c. 1543-1623), and Gibbons (c. 1583-1625), Purcell forged an expressive musical language that embraced and shaped emerging Baroque style in England. His ode Come Ye Sons of Art, composed in 1694 to honor the birthday of Queen Mary II, is a setting in several movements of a text attributed to poet laureate Nahum Tate (1652-1715). It was Purcell's sixth and final composition of this sort, as the Queen died later that year. The seventh movement of the nine, Bid the Virtues, is an aria for soprano, oboe, and basso continuo. The voice and oboe sing together in imitative dialogue, supported by a bass line with harmony ad libitum. THE VISUAL ARTS AT SMV . . . There is an exhibition of new work by the painter Lola de Miguel in the Gallery in Saint Joseph's Hall. Lola, who was born in Spain, now lives in New York City. She has studied painting at the Art Students' League. This is her third show here at Saint Mary's. Her work-the current exhibit is called "The Jungle"-is always marked by vivid colors and arresting images. The pictures at first seem abstract. However, when one looks more closely, images of flowers, vegetation, birds, and other animals begin to emerge. They invite a careful and contemplative gaze . . . On Saturday, September 29, at 6:00 PM, an exhibit entitled "Spirit's Flight" opens in the Gallery in Saint Joseph's Hall. This exhibition features the work of two artists, Deborah Holcombe and parishioner Ingrid Sletten. Ingrid and Deborah's work, in different ways, explores the intersection between nature and the spirit. They have subtitled the exhibition "More Than the Eyes See: Combining Science with Revelation." An Artists' Talk for this exhibition will take place on Friday, October 18, 6:00-8:00 PM. CONCERTS AT SAINT MARY'S . . . Saturday, October 13, 2018, 8:00 PM, Miller Theatre Early Music Series, Stile Antico: "Elizabeth I, Queen of the Muses." Music by Byrd, Dowland, Farmer, Ferrabosco, de Lassus, Sandrin, Tallis, Taverner, Weelkes, Wilbye, and Willaert. From the theater's website, "Queen Elizabeth I presided during a time that delighted in the talents of some of the most renowned composers of the Renaissance, including Thomas Tallis, William Byrd, and John Dowland. The exquisite Stile Antico explores the reign of the great Tudor Queen in a program illuminating the life of a court that rejoiced in some of the finest music ever created." For more information and to purchase tickets, you may visit the Miller Theatre website . . . Saturday, October 20, 2018, 8:00 PM, New York Repertory Orchestra (NYRO). NYRO returns to Saint Mary's for another season. On October 20, the orchestra will play music by Clyne, Mussorgsky, and Mendelssohn. Admission is free, but a donation is encouraged. Visit the orchestra's website for more information . . . Saturday, November 10, 2018, 8:00 PM, Miller Theatre Early Music Series, Cappella Pratensis: "The Josquin Imitation Game." Music by Ockeghem, van Ghizeghem, des Prez, Willaert, Gombert, and de Rore. From the theater's website, "Josquin des Prez paid homage to his predecessors through the use of imitation. By the same token, subsequent composers played this game as a deliberate tribute, utilizing the same texts, melodies, and other characteristics of his music. The acclaimed Cappella Pratensis, known for their period interpretations, makes their Miller debut with a program anchored by Josquin masterpieces and exploring some of the great polyphonic works of the period by composers who inspired Josquin and those who were later inspired by him." For more information and to purchase tickets, you may visit the Miller Theater website . . . Saturday, December 1, 2018, 8:00 PM, Miller Theatre Early Music Series, Tallis Scholars: "A Renaissance Christmas." Music by Nico Muhly, Palestrina, Nesbett, Byrd, and Praetorius. From the theater website, "The renowned Tallis Scholars make their annual appearance on Miller's Early Music series with beloved, festive Renaissance favorites including Palestrina's Missa Hodie Christus natus est. The thrilling program features the world premiere of a work commissioned by Miller Theatre for the occasion by sought-after American composer Nico Muhly." For more information and to purchase tickets, you may visit the Miller Theater website.